The Royal Parks Half, presented by Royal Bank of Canada, is the stunning central London Half Marathon which takes in some of the capital’s world-famous landmarks on closed roads, and four of London’s eight Royal Parks – Hyde Park, The Green Park, St James’s Park and Kensington Gardens. Runner level: Steady pacer, never fast, super endurance. This ties in with the fun fact that I mostly enjoy the challenges of winter running, in the cold, snow and Xmas fun runs. In fact – “all dressing up runs “are good for me ! Why run for St Mark’s? Carol: The reason it is very important to me to fundraise is that I wish to show my appreciation to St Marks Hospital. 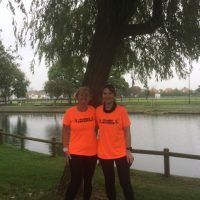 Although Kathy and I have raised funds together, I will not be able to run the Royal Parks Half Marathon this year now as I have been given a date for surgery which I believe will help me so much. It is only 1 month before the run . However , I will (If I am able, go along to support Kathy and the team). I really want to run the race which means so much, so my place has been deferred until next year. I am extremely grateful for all support. As a friend of the family, Kathy has been roped in to running too! To find out more about their running journies, click here! I have many friends who are patients at St Mark’s Hospital and even more who suffer from Bowel Disease. These are debilitating conditions that come in an array of disguises and you truly might not realise the pain and suffering one can endure and still manage to put on a smile. To find out more about Colm’s running journey, click here! My son Eli is under the care of St Mark’s and whilst it is currently a venture in to the unknown with him, I feel so much happier knowing that he is always going to be provided with a service of the absolute highest quality throughout his time under them. I have seen first-hand how committed and driven the staff are and in a time where our health service comes under (most often unwarranted) scrutiny this is both refreshing and re-assuring. To find out more about Robert’s running journey, click here! Saj: I’m a Crohns patient at St Marks Hospital and have been for many years. I was diagnosed at 14, and for all of my adult life I have been going to St Marks. They have helped me a lot with my Crohns so would love to do some fundraising! I actually took part in the marathon in 2013 for St Mark’s so looking to get back into it and join for this year. As a friend of Saj’s, Shan has been roped in to running too! To find out more about their running journies click here & here! Rachel: Anyone who knows our family knows that St Mark’s Hospital plays a huge part in our lives. Toby has a very rare genetic condition called Peutz-Jeghers Syndrome which causes him to grow polyps in his intestines. Every one of these is potentially life-threatening. Not only can they cause a fatal blockage, each has to be tested for cancerous cells. How on earth can you thank a team who do so much to keep your son alive and well? There are no words but we feel we must do something. So, we are walking a half marathon to raise money for the unit. It’s a small way to show our gratitude and we appreciate anything you can give to this very worthy cause. Justine: Toby has been under the dedicated care of the same team of the world-leading bowel unit at St Mark’s Hospital in Harrow since he was diagnosed with Puetz-Jeghers Syndrome aged six. His surgeons and their support staff couldn’t do more for Toby and the family if he was their own kin. To find out more about their running journies, click here & here! We couldn’t continue with our life improving and ultimately, life saving work without supporters like you. You’ve helped us to get one step closer to our goal of a future free from the fear of bowel disease!